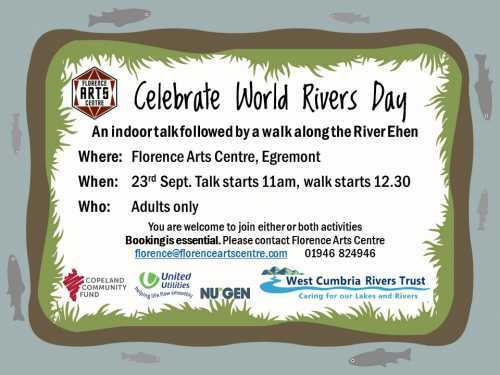 We’re celebrating World Rivers Day on Sunday 23rd Sept with a talk on how you can take action for rivers, and a walk beside the beautiful River Ehen. You are welcome to attend either or both activities, but please bring a packed lunch if you intend to stay for both. These activities will be designed to appeal to adults. The talk starts at 11 and will last around 45 minutes. The walk starts at 12.30 and could be a shorter linear stroll of a few miles or a longer circular hike of around 4.5 miles depending on the wants of the group and the weather on the day. Please contact Florence Arts Centre to book.